As a young photographer, I was often disappointed by my photos. There was no instant feedback as with digital images. And, as I began to learn digital photography, I realized that so many of my images had small subjects—disappointingly so. Cropping in post production with Photoshop didn’t help. What I needed to do was fill the frame. Photo by Marina Aguiar; ISO 320, f/5.6, 1/500-second exposure. By filling the frame you add instant impact to the image. You exclude unnecessary clutter and bring a dynamic element to the photo. There is an incorrect assumption that you have to have every part of a subject or object for the image to be complete—not so. There is no reason why you can’t chop off parts of the subject when getting in really close. When shooting a person, get in really close and shoot just part of the model’s face. This gives a dramatic effect. So why should we fill the frame? What are the benefits to doing this? The larger the subject the more detail is included in the final image. The classic photo I shot many years ago was one of my grandmother. We had lots of shots with her alone, but they were disappointingly small and we couldn’t see much of her. The one I chose to put on my wall years after her passing was one of her tightly cropped face. All the wrinkles, character, and smile lines were accentuated and the details of her face dramatically enhanced. Why is it on my wall? Because it was by these details we remembered her character. This is why macro and close-up photography are so interesting—we see details we are not usually aware of. Photo by Steve Evans; ISO 800, f/6.3, 1/320-second exposure. It is not easy to capture the mood of a subject when it is small in relationship to its environment or surroundings. A dominant subject is more dramatic and imposing when it overshadows all other elements of the image. This is especially true of people. The speaker in a crowd is not as imposing in relation to the crowd, but, when they dominate the image above a sea of heads the mood changes. The emotion of the speaker is emphasized when zooming in closer and aspects of the person are revealed that can’t be seen when lost in the crowd. The easiest and most simple way to rid your image of a busy, dominant, or cluttered background is to get in closer to your subject and fill the frame until the background can no longer be seen. By including dominant, irrelevant or distracting detail in a background you detract from the memory you are trying to create. In 20 years time, when the person has passed away or the subject has been demolished, what memory are you left with? Are the objects in the background that important anymore, or do you want to see more of the loved one? I think you can answer that question yourself. The smaller the final image is going to be displayed, the larger the subject in the image needs to be. 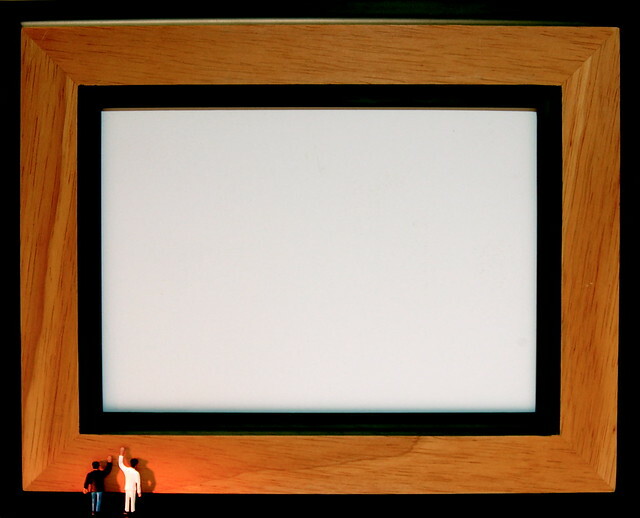 A small subject on a large billboard is still dramatically large, but the same photo displayed in a digital photo frame on a sideboard in the lounge will have no effect on the viewer. When shooting a photo, always have in mind the final use of the image. Filling the frame completely is not always appropriate, so think carefully when creating the image. If you aren’t going to fill the frame, make sure that you use the space around the subject constructively or creatively. Nothing should be in the image that will detract from the main subject or focal point. By filling your frame you will dramatically improve your images as you learn photography. Happy shooting! Wayne Turner – I have just bought an 85mm f/1.8 Nikkor. Tried it out with a few portraits of my grandson. Yes! Filling that frame makes all the diffrence! Point 4 especially applies to photos accompanying newspaper obituaries. When the final print is a low resolution 1.5″ x 2″ I wish they would crop in so we could see their face.